Today was another Saturday at the farmer’s market when it was threatening to rain, but it didn’t deter the locals. I’m using a different approach to my shopping this season, buying only what I’m absolutely sure I plan to cook within a week, rather than picking something because it looks god and i might be able to use it. Tonight’s dinner (recipe post will follow soon) requires spinach and asparagus, so I got a bunch of each. The kale and pork chops will be a weekday meal along with some leftover grits. The strawberries are for dessert, and the tomatoes will go into a salad or two. 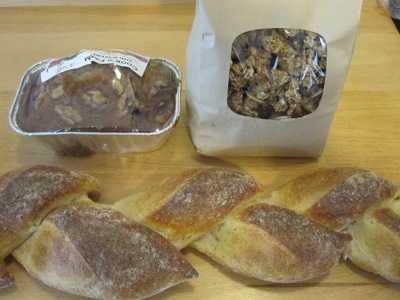 My favorite baker is back, so I bought a bag of her cranberry-almond granola and a small loaf of banana bread. The pain d’epi is from Iggy’s and will complete tonight’s meal.